Origin is a modern and intuitive application that includes a store where you can buy the latest games, manage them, and communicate with your friends. 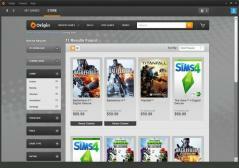 To use the app you will need to login into it using your Origin account credentials. The main window offers 3 categories: Store, My Home and Game Library. From the My Home section you can view interesting gaming news and articles, as well as titles that are currently popular on Origin. From the Store section you can find free games, deals and browse all games that are currently for sale. The Game Library is where you can organize your game collection, download previously purchased items to your PC, and add specific games to your favorites section. Origin also includes a built-in chat so you can talk to your friends using the app.